We took a train from Florence to Rome. It was short and not very scenic. When we got to Rome I went with Susie to her friend from home’s apartment. It snowed in rome for the first time since 1992 so all the cabs weren’t working. They claimed they didn’t know how to drive in the snow. It was horrible. The whole city like shut down. It was annoying and hard to go anywhere but very cool to witness Rome in the snow. After we got to the apartment, we went to the Roman Forum. It was cool to see the ruins. There is so much history in rome. It would be a cool place to study abroad. After that we went to the collesium. It was really cool. I see so many pictures of it and it was cool to be right there. It was where the gladiators fought. A fun fact is that there was so much blood that it had to go somewhere so they invented the drainage system to get rid of the blood. We also saw the Spanish steps when we first got off the metro. I didn’t realize what it was but took a picture anyways. We then went and got a slice of pizza. It was amazing. Just as good as I knew it would be. 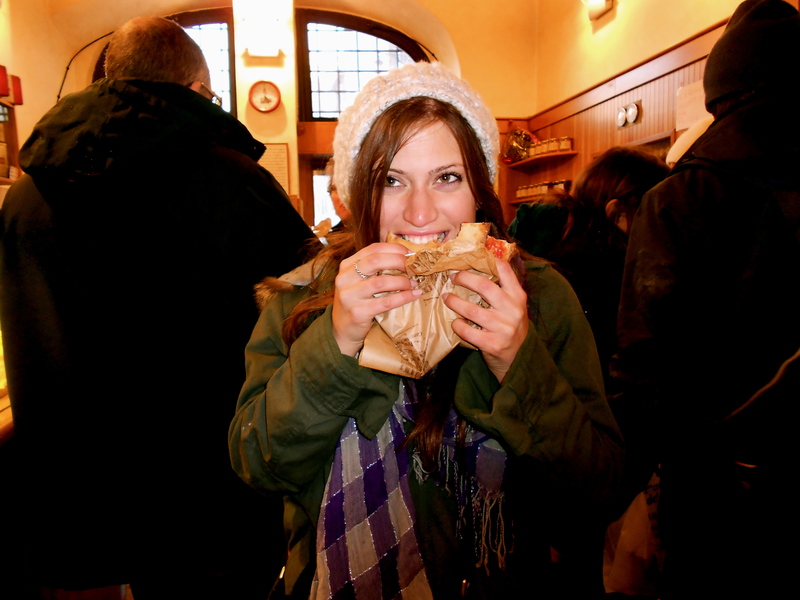 It was a cute little shop where everyone is standing around eating pizza out of a brown paper bag wrapped around it. The girls I was with got some yummy fried doughy dessert. It was great also. It was super cold so we went back to the apartment to warm up. It was miserably cold and hard to go sightseeing, but I stuck it out and knew I had to see it all and fit it all in. I was dedicated to taking it all in. We then went to the Vatican. It was cool to see. The pope didn’t come out though. It was too snowy, so he stayed in! The Vatican was pretty beautiful. I then took a cab by myself to the hostel. It was gross but very cheap, so it was well worth it. I took a shower and had trouble leaving the shower because the hot water felt so good after being out in the cold for so long! We then went to the best restaurant in rome. 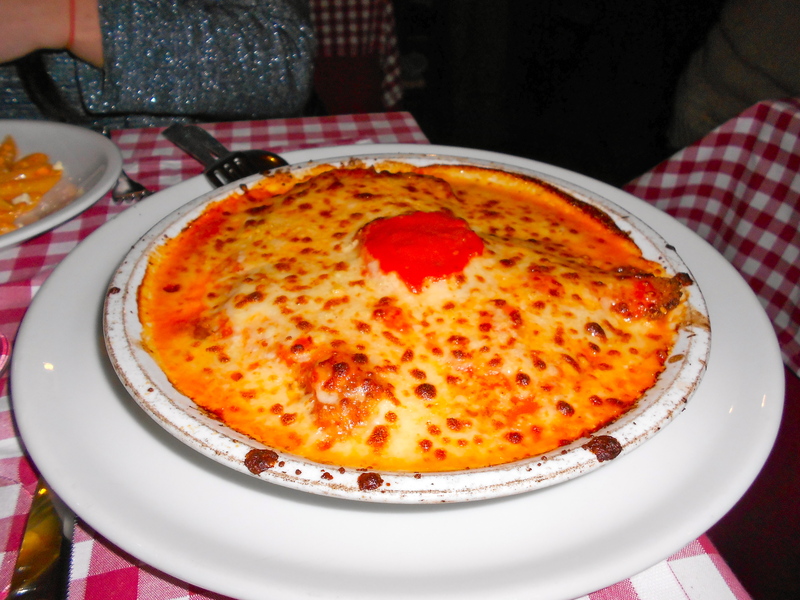 Its called Tonys and was amazing. It was such a scene though. Everyone that was visiting went there. I walked in and saw the entire jewish population from the east coast. We ate fried calamari that I didn’t really care for. We also got chicken parmasan and penne vodka. We got a lot of wine for free. We also got free dessert. There were no cabs, so we couldn’t find a way to get to the club that our friends were going to. We gave up on trying to find transportation, and figured it wasn’t worth it. We ended up going to this restaurant and got a few drinks with the Arizona boys. We stayed out for a while. We couldn’t get a cab home so we hitchhiked. I was with the Arizona boys and this guy in a brown Mercedes picked us up and it was super shady. When we woke up in the morning we went to this restaurant and got what was called an “American breakfast.” It was stupid of us but it was really great. It was eggs and pancakes and then we split a waffle with nutella it was AMAZING! We then left for the airport. On the way to the airport I found this graffiti on a wall. 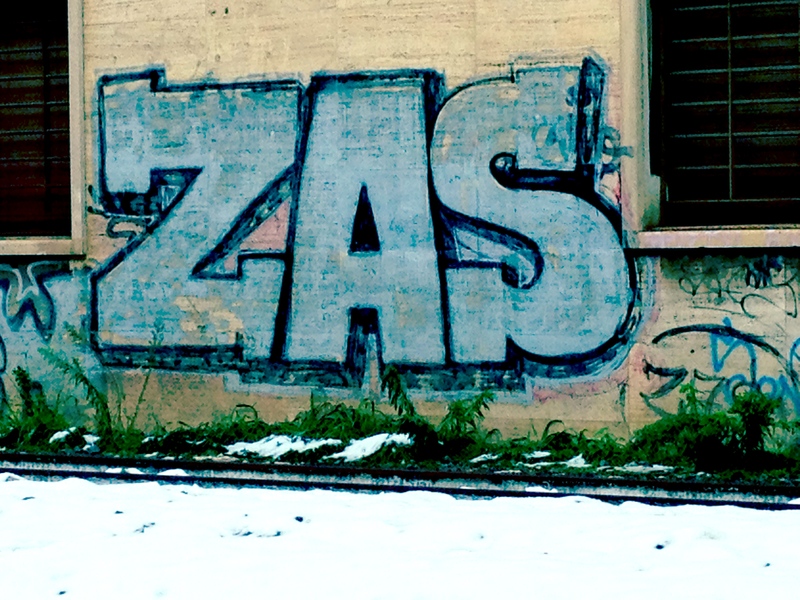 All of my friends call me ZAS and I saw it sprayed on a building. I immediately stopped the cab and ran out to take a picture. After I got my picture, I hopped back in the cab and proceeded to the airport. 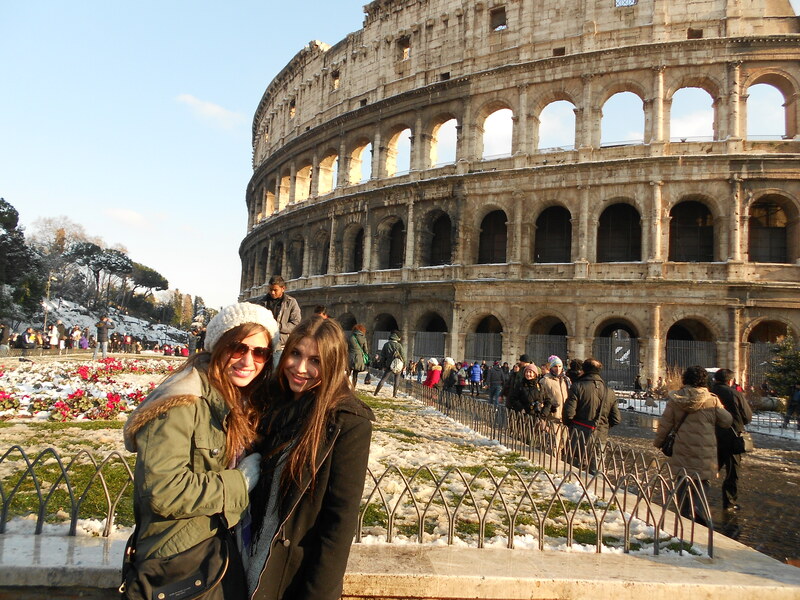 All in all Rome was a great trip. I would love to go there sometime when it is nicer out.